they end up costing you around $10 each. Feeding the turkeys isn't that expensive, but I've found that turkeys, unless closely penned, tend to kill themselves at a uncomfortably fast pace. So last year (2008) I purchased some turkeys, and hatched some turkeys, and watched my costs and decided that this year (2009) I'd keep a breeding flock and hatch my own turkeys. So in February I was on schedule. I had 60 turkeys here, which given the laying rates I'd experienced, would produce me around 600 eggs a month during the high laying season, which I figured would allow me to sell some, and keep enough to be able to fill about 300 turkey orders come thanksgiving and Christmas. The first problem I had is that free-ranging turkeys are very good at hiding their eggs. So good, in fact, that I didn't find most of them. I'm still finding turkey nests with rotten eggs here and there, 6 months later. The second is that a turkey will not get off its nest for any reason. So I started loosing turkey hens to coyotes. This was actually pretty bad -- worse than I thought. Since the hen was out somewhere in the field it'd usually take me most of a week to notice the feathers, and by then, I couldn't even salvage the eggs she was sitting on. the cold and wet killed them after the hen was taken. I lost a good half of my birds to coyotes. I started shooting the coyotes, and I penned my remaining birds, but once in the pen they went off lay. I can't say how frustrating this was. The third problem I had was with the incubators. It turns out that one of my five incubators I got never ever hatched even a single egg. I still do not know why. So 20% of my eggs didn't hatch right off the bad, and the fertility went way down when they hens got penned, and overall, I wasn't a happy guy. Since eggs take 3 weeks to hatch, noticing that one of my incubators was killing all its eggs took me 8 weeks to notice. I was throwing out buckets of turkey eggs. 5 gallon buckets of turkey eggs. Finally, during this whole thing I had birds disappearing from my farm. Some got killed by dogs from the dog park, i think. I'm guessing that because the coyotes come from the back of my property, and the dogs come from the front, and I'd find feather trails leading from my main farm yard, where the turkeys hang out, towards the front gate and through it. When the coyotes take a bird they go out to the woods in the back to eat it. The second thing that I believe was happening is that people would come by, see i wasn't there, and just take the birds. They're hand-tame, and I have a base of customers that buy live birds, and taking a bird saves them some money. I had several neighbors report people stuffing turkeys into their cars and driving off. I finally installed a security system, and so I can verify a bird being stolen, but this was the icing on the cake for a tough turkey year. 1) Breeding turkeys need to be securely penned in turkey-comfortable coops during the entire laying season. I'd like to maintain the free-ranged part of my farm, but I've got to be realistic -- I'll never be able to produce the quantity of poults that I need in any other way. 2) I need to get serious about my coyote control program. First step is to improve my fences to deter them, but the second is to have the dogs out there every night watching the farm, and the third is to use the security system to keep watch every day for coyotes, and remove them as needed. 3) I will keep records of hatch rates for each incubator from day 1 and use chicken eggs to make sure that everything is good prior to the turkey hatch season. I also need to keep records on which egg came from which flock or even down to which hen -- because I suspect that some of the hens never produced a fertile egg. 4) I need to keep the production birds away from the road and driveway to help deter thieves. This years turkey crop was pretty much a complete failure commercially. I'll have a couple of turkeys I can sell, but I'm pretty disappointed. This coming year I will be purchasing poults again, and I'll try hatching again. I'm going to maintain the goal of my own breeding flock, and hope that the change in husbandry makes the difference between success and failure. I've written about my $5 calves before. They're a byproduct of the dairy industry -- male cows that aren't useful in the dairy business. Turns out that they've worked out how to have cows have mostly female offspring by sorting the sperm of the bull. That's amazing. It's a pretty fundamental change to the dairy business. Huge. You'll find the article here. The pink pigs have just been introduced to the other pigs. They're a little scared; the other pigs are bigger, and more important, they're stranger pigs. They'll work it out. In the lower right hand corner one of the pink pigs has spotted shorty nursing her piglets, and is going over to say hello. They instinctually view larger pigs as safety. I'm keeping them in fairly close proximity for a few days, and then they'll move out to a circular pen to condition them to respect the electric fence. I don't know if you can say that a pig smiles, but here's shorty doing her best. As she nurses her foster litter. They're about ready to be weaned. There's a double row of piglets there. I met a husband and wife team today that I was really impressed with. Patrick and Dawn Mcphearson have been teaching their daughters Shelby and Kendra things I consider important for kids to know via raising and selling pigs. Here's the backstory: As I've mentioned I've been buying pigs from various small farmers in the area. I ran across their ad on the local craigslist, and went out to their farm to take a look at the pigs, and their setup. I'm pretty picky about who I purchase from; I'd like to reward folks who do a great job, and Shelby and Kendra qualify. The basic operation is run by the two kids, and they pay their costs and split the profit with the family. What I really like about this sort of arrangement is that it teaches kids that hard work pays off if you work smart, and patience. With pigs or any other livestock, even most businesses, there's no quick fix. No easy money. No get rich quick. And the sooner a kid learns that, the better, in my opinion. Patrick offers that "well, when it's the kids job you know who really has to do the work sometimes, but they do a great job." The other thing that Patrick and Dawn are teaching them is that animals, treated with kindness, respond well. That's not to say that these animals are pets. "I only let them name the animals with what they'll become. Bacon, Pork Chop, Ham. Well, they named one strawberry, and I don't know where they got that from, but at least it's something you eat", says Patrick. Couple of things you should notice about the next photos. First, there's actually grass and pasture that the pigs have. Most pig yards are mud and rocks, or concrete. Nice to see someone give the pigs a chance to do pig things. Patrick is about to exhibit pig judo. He's going to throw that 200lb pig. Here he's using the motion of the pig to flip it on its side. Having done that, he completes the motion, bringing the pig to the ground. Here's what struck me about their operation: First, spotlessly clean. Pressure washed and didn't smell at all. That's hard work. Second, the pigs were easy to handle, tame and friendly. That means that they've been treated well and not mistreated. All of the pigs were good weight and without blemish. Good job, Girls! Ok, I was kidding about the pig judo. Patrick was rubbing the belly of the sows, and they like that so much that they'll flop right over and lay there for a while after you move on. Some folks who raise pigs are afraid of their animals. A good producer maintains a proper relationship that's all business, but friendly. Didn't surprise me that Patrick comes from a dairy farm background. As I've said before, I'll hire a dairy kid any day. Dairy is the hardest form of farming that I know of. on my farm is illegal. My court case is March 16th, but between now and then I've got the opportunity to ask questions and depose Paul Anderson, the ecology biologist who cited me and apparently believes that mulching is wrong and evil. So if there's any question that you can think of that pertains to ecologies viewpoint on farmland, I'd like to include it so that it can be answered by Mr. Anderson as sworn testimony. This is an opportunity to ask any question you'd like to to an enforcement officer of the washington state department of ecology. I'll post the answers as I recieve them. What detectable pollutants do wood chips emit? The washington department of ecology encourages the use of wood chips and hog fuel as animal bedding. Why is that use allowed and encouraged, but this use as mulch cited and potentially fined? Snohomish county uses wood chips for paths and walkways through all of the wildlife areas that they manage, in up to 7' depths. Why is ecology not enforcing this statute in that case? The army corps of engineers allows the use of wood chips and other soil amendments and mulches as exempt from any permit. Why does ecology want to ban these uses here? Have you ever cited anyone else for the use of wood chips? A weaner pig is a pig that has just ended nursing off its mother. It's a pig that has been weaned. That usually means around 8 weeks, but some folks take their piglets off the sow earlier and smaller. That's called "early wean", or EW. You'll see that acronym or term if you look at pig auctions. This blog entry is about winter pigs. From a profit perspective, winter pigs make a little more money than do summer pigs, based mostly on the price you can purchase the weaner pigs at. A typical weaner pig price varies from a high around march to a low around December, and then repeats. That's because if you buy a pig in march or April, the bulk of the time you have the pig it's relatively easy to care for. The picture above is of a batch of weaner pigs I've purchased socializing with a litter of pigs that I had born on my farm. The mother of the brown and black spotted pigs is visible in the lower right hand corner. you can see her ear. 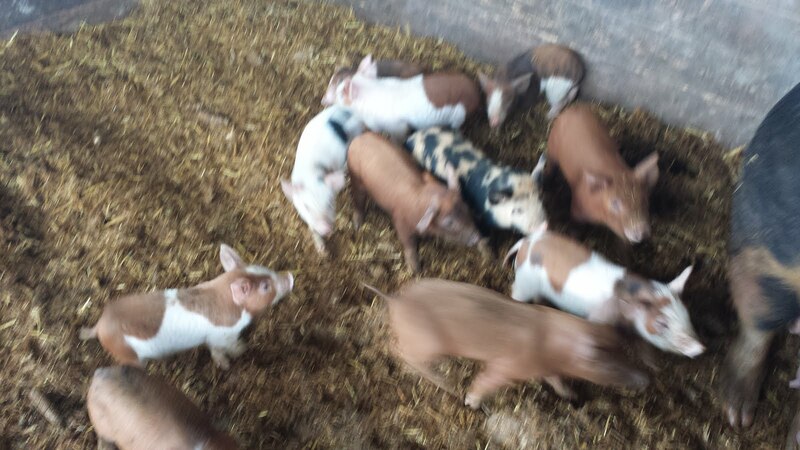 I'm aiming at having enough sows on hand to produce the number of piglets that I need, but I haven't reached that point yet, so I have to purchase pigs from other farmers from time to time to supplement my own breeding. Winter prices are an attractive time for me to add to my herd. Pigs are very social creatures, and if at all possible I try to buy a whole litter, or out of a whole litter. If I mix pigs from different producers or litters they spend quite a bit of time fighting each other to figure out what the pecking order is. When you buy a little and keep them together you don't have much fighting -- the pecking order has already been established. In this case there were 8 pigs available for sale. 5 of them looked good, 1 had good weight but I didn't like its posture (I'll talk about that in a bit) and two were underweight. Since the seller said that they're all from the same litter, I'm going to assume that they've all had identical access to food and water. When I buy piglets from other producers, I"m usually buying them from a confinement system of some sort. These piglets were raised in a barn, and were given good shelter and water, but they've never seen sunlight or dirt, or taken a drink from the ground. So an important part of integrating this group of piglets into my system is to give them time to get used to what the rest of their lives will be like, and the cast of characters that will be caring for them. Here, Red the Airedale, is sniffing at the pigs, and the pigs are learning what he smells like and to not panic when a dog is around. They're also learning to drink from the ground. I introduce piglets to our system in stages. When the piglets first arrive the first thing to consider is the possibility of parasites, disease and overall condition. So I dust them with a powder to remove lice and fleas and put them into a quiet corner of the barn with all the food and water they can handle. After a day or two of that, we go to stage 2. They're bedded with hay, and given all the food and water they can take, but I remove the visual blocks so that they can see other pigs and touch noses with them, but they can't contact them, for their safety and for the other pigs safety, too. Stage 3 is where they're put into a larger pen on grass, surrounded by a hard wire fence and an electric fence on the inside. This is to condition them to respect the electric fence, and to give them the opportunity to mix with all of the other pigs of their age. The bonds they form here will be lifelong, and will pretty much determine who they hang out with. They'll usually sort themselves out into social groups of 8 to 10 piglets. At each stage they see me every day, and I work on having positive interactions with them. I scratch them, and give them food treats, and generally work with them so that they're used to being handled and cared for. I become a regular feature. This is crucial to my operation because we run minimal fences, and I need them not to panic when I approach. A motivated pig can run right through an electric fence. I've got no connection to American Towing other than as a satisfied customer. I'd like to offer special thanks to Mike, the owner, for his help in getting me out of a jam. My truck refused to start when I was picking up lunch, and I was stuck in a parking lot. I figured it was probably the starter motor -- but I didn't have a starter motor, and I didn't have my tools, and I was in the middle of this parking lot. So after putting the truck in neutral and pushing it over to the side, I spent a little time looking for some easy solution, and there just wasn't one. I'd have to either get a cab down to my farm and get the tools and then a cab to the auto parts store for the part, and then hope that I didn't forget anything, or I'd have to have the truck towed to either a dealer, or my farm. If I went to the dealer, I couldn't see myself getting out of there for less than $600. And since I figured it was the starter motor, and we're talking about 3 bolts here, i was pretty sure the fix would be simple. hmm... tow truck it is. I chose American basically at random, and I was glad I did. The rate quoted over the phone was $85, based on my 4x4 truck, and mike appeared in minutes. When I explained that I had a driveline disconnect, he said "oh -- we'll charge you the 2wd price". I was more than willing to pay the quoted price, and he won big points with me here. but then he said "oh, it's the starter motor? If you want, I can tow you to my yard; there's an auto parts store on the way, and I can just leave you hooked up to raise the truck so you can work easier. ". Wow. I explained that I didn't have any tools, and he upped the ante, "looks like you need a 9/16 and maybe a couple of sockets and an extender; i can lend you them. ". And it pretty much went as planned. except that I'm an idiot and didn't tighten the 3rd bolt enough so that the starter wouldn't engage, so the replacement took me a total of 90 minutes to complete. 1) He appeared in minutes and my truck was hooked up and under tow in minutes. Professional, prompt, perfect. 3) No charge for waiting at the auto parts store, or for the use of his truck in helping me replace my starter. 4) Stayed after closing so I could fix my own mistake. Mike is a sole proprietor, and while i was laying under my truck he and i talked about starting businesses, and he told me that he'd worked 337 days as the sole guy at his business because of a loss of contract -- sleeping with the phone near his head 24 hours a day, responding to calls. So to Mike, I appreciate the dedication you show to running your business, and your kindness in helping me out of what could have been a pretty serious pickle. Your help allowed me to get back on the road and off to do my stuff, and I really do thank you. I got a call from one of the better farm slaughter guys I use, Al Stevens from Sylvana meats. I'd talked to Al a month or so ago, and mentioned that I was interested in a raw beef hide for dog chews and rawhide. When Al goes to a farm to do a farm kill of a beef, the hide is usually kept by him as part of his compensation. He turns around and sells it to local tanneries and folks at the end of his day. For instance, in the last few days he's butchered 45 beef. What he was calling me about was 3 buffalo hides that he had. He'd just butchered 3 buffalo bulls, and he wasn't happy with the price he was offered for them from the tannery, so he was calling to see if I was interested. In the picture above you can see the "hump" on the back of the hide. It's actually a bit like a lions mane. The hair is longer there as well as there being a fat pad that develops as the animal stores food. I arranged to go pick up the hides, and on the way picked up a 50lb bag of salt. The tannery wants these hides well salted when they're fresh. I laid the hides out on my flatbed trailer one by one, fur-side down, and then put on a good thick layer of salt. As I finished each hide I laid the next hid on top. Tomorrow I'll take a skinning knife and scrape off the odd bits of fat and meat on the hide, throw some more salt on it, and Wednesday I'll ship it off to the tannery. I don't really have a plan for the hides; they're about 4'x6' each. One has no holes in it, the other two have one or two holes. The hair appears to be in pretty good shape. I'm a little curious to see how they'll turn out. I've been thinking about adding ducks to my farmed products. I like the idea of ducks because they're grass eaters, and prolific egg layers, and are pretty easy to care for. These are Peking ducks, a meat/eggs breed. I'd guess they weigh in at 10lbs now. I'm curious to see how they lay, and how duck eggs compare to goose and chicken eggs. Brooding and raising the ducks isn't the part that I'm really concerned about. It's how difficult it is to sell them, and to pluck them. I've had 2 or 3 people ask me about duck, and in that same timeframe I've sold about a thousand chickens. With no demand, I probably won't keep more than a few. I like eating duck -- and duck confit is one of the greatest things on the face of the earth, but that's just me. For my immediate friends and family I haven't been able to find anyone who's eaten a duck in the last year. I broke the basic philosophical rule of my farm with these ducks: Only animals that I and people I know eat. I forgot to poll the other folks. This is my katahdin ram, who's been glued to the pasture fence next to the 12 new ewes for the last week. He's certain that they could use his attention, and for the ewes part, they're certain that they would like that attention. He'll have to wait another 2 months however -- having lambs in February would be pretty tough. Breeding these ewes in November will give me a birth time end-of-march to early April, which around here is usually rainy, but warmer and easier to care for the new lambs. I'm seeing large flocks of Canadian geese going over my farm. They're really beautiful birds. The average size I'm seeing sis about 50 birds, either in a line, like these guys, or in a more traditional V shape. So far they haven't landed on my land, and I wonder if they will sometime. I've got geese here on the ground, and decoys do work, but so far they're all passing. One flock did fly pretty low today; maybe 200' up, sounding like a whole herd of trumpets. This is a whole pig cut-and-wrapped. I've got two pigs that are ready to go in the next couple of weeks. Price is $2.25/lb hanging weight, head-on, skin-off. One of the two is the black pig at the top of this photo. Both are 75% berkshire, 25% yorkshire. Nice pigs. Cut-and-wrap is 60 cents a pound, smoking is 60 cents, farm kill is $60. If you buy a half, the farm kill per half is $30. Total commitment, including all fees, about $350 per side, total yield of finished cuts about 90lbs. I'm used to seeing brussels sprouts show up later in the year, but ran across a good buy on them down at the carpentino bros farm stand in Kent, WA. They were selling them whole on the stalk, as shown. I've already eaten some of them off the bottom of this stalk, and the recipe is below. Leghorns have become my favorite chicken. They're not particularly cuddly -- in fact, they're a little flighty and panicky -- but for egg-laying capacity, they can not be beaten. I keep a mixed flock of leghorns and several other breeds, and so it's pretty easy to compare the leghorn against the barred Plymouth rock or the Rhode island red, so here's the rundown of the breed as I see it. The first thing you should probably know about the white leghorn is that this is the smartest chicken in your flock. You can see the wheels turning in their heads, and if there's a way to get out of the coop, or get into the food sooner, or get into a place that a chicken shouldn't be, that's where you'll find the leghorn. Now that's not to say that chickens can be compared to other animals in intelligence - it is a chicken after all - but the leghorn is the mental giant of the flock. I had a sack of feed in my parking area; I unloaded it from my trailer, but had to go pick up some other stuff before I could put it away. So the supersack of feed sat for a few hours one afternoon. Coming back, I found it FILLED with leghorns. Stuffed so completely with leghorns that the bottom ones were getting killed by the weight of leghorns above. All of the other chickens were still trying to figure out what was going on, but the leghorns had it nailed... well, as far as leghorns think. They're not really good on future tense. "How can I eat food this instant" is pretty much a leghorn thought. "I might die in 5 minutes if I get into the bag with 55 other leghorns" is too much of a leap for a leghorn. Leghorns come in a variety of colors, but they all have that upright stance and general body shape and weight. Here's a pearl white leghorn hen and a red leghorn rooster. The red leghorn is also a pretty smart bird; I keep him mainly for decoration. Leghorns really don't have much meat on them, so they're not really worth eating. Here's a white leghorn hen next to an meat chicken of the same age. the meat chicken weighs in at 6lbs live weight. the leghorn is around 2lbs. Leghorns do great on forage, but given their lack of foresight I have to watch that they don't put themselves in harms way. Running after the tractor and scratching in the plowed dirt behind it is great. Figuring out which way the tractor is going and waiting in front of it, not so good. A good white leghorn hen will produce 300 eggs a year. They'll lay a month sooner and a month after every other breed. Their lower body weight means that they don't have the calorie needs that larger breeds do, but produce eggs that are just as big. They're a very efficient way to turn feed into eggs. The only drawback is convincing customers that white eggs can be free range, and organic. Most customers have been led to believe that free range eggs are brown, and that's that. Which is a pity. I'd like to see more farms adopt leghorns as part or all of their laying flock. Last year I purchased a ram and 3 ewes to see what sheep husbandry was like. I grew up reading the James Herriot books about being a country vet in the UK during WWII and remember clearly the stories about how birthing was difficult. So when I started keeping larger animals, my first concern was the difficulty when they reproduce. In the case of sheep, how difficult lambing is/was. By the way, I highly reccomend Herriots books; they're G rated, the have a lot of animal stories in them, and I really liked the portrayal of small english farms. So I purchased 4 animals so that I could get a feel for what it's like to work with sheep, and to get some experience in a small way with the birth. Unfortunately, while the lambing did go well, I lost all of the lambs, but the lambing portion of that went pretty smoothly. Sheep graze differently than to cattle; they graze closer to the ground, and given the choice between long grass and short, seem to prefer the short. As you can see from the above picture, they keep their paddock pretty groomed. It looks a lot like a lawn. It's interesting to note that given the choice between grass and shrubs, they'll eat the shrubs first, as will the cattle. Guess the shrubs are tastier. I paid a bit more for these sheep than I really wanted to, but I wanted to buy quality. Anytime you're buying livestock from someone who breeds that animal, you should expect to pay a bit more for quality, because the breeding farmer wants the same things you do -- a relatively trouble free animal with a long future of productive seasons. the first three ewes I purchased last year were culls from his herd because I don't know much about sheep, and didn't want to lose a bunch of money if I screwed up the husbandry. Doctors bury their mistakes, farmers eat them. So I'll confess here. I actually purchased 4 ewes, and one of them did die over the winter, and I did eat it. It's part of the learning curve whenever you start a new endeavor. I always plan on a setback or two. My reasoning behind sheep is from my overall philosophy on the farm: Only animals that I eat. I love lamb and mutton, in curries and stews, and have eaten it for years. I chose this particular breed because they shed their wool every year -- you'll see in the picture there's a patch of wool on the rear leg of the brown ewe; they've shed the rest of their coat. Traditional sheep breeds don't shed, and for folks who want or need the fiber, that's a good thing. but for a farmer primarily raising the animal to eat, having to shear the sheep every year is a big chore, especially if you have a lot of sheep. These ewes are all from triplet-breeding stock. All of their mothers and the ram they were bred from produced triplets, and the hope is that they will produce triple lambs as well. The gestation period for sheep is 5 months. I'll be keeping these ewes away from the main sheep herd until November, when I'll put them in for breeding. I'd rather not have to deal with lambs February or march, so I'll delay breeding so that the lambs show up in April, when conditions are a little better, and a little warmer. I'm relatively new to canning, and so approach the whole process with deliberation. My main concern is that I'll can something that doesn't taste good, and I won't know about it for months. The solution that was suggested by a couple of different blogs is to do test batches. A test batch is a smaller-than-normal batch that you make to experiment with different tastes and methods to see what actually works for your own personal taste. There's also quite a bit of random prohibitions out there about what you can, and cannot, can. Some of them are based on food safety -- like pressure canning meats, seafood and poultry -- and some appear to be based on preference or appearance. 1) raw Ground pork, plain. What I'd like to come up with is a couple of different variations on canned pork that would be good on top of rice for a quick meal, or as an ingredient for a quick meal. Open a jar, throw it into the microwave, eat. Of this current test batch, the pork in mushroom soup, the browned pork, pork with cloves and the pork roast in chicken stock are the favorites. I'll do another batch tonight with some more candidates. If you're interested in canning, at the bottom of this post is a summary of the process of canning. I lucked into some local fresh silver salmon (coho salmon), gutted, but with head on, for $2.00/lb, provided I bought 50lbs, which ended up being 6 fish. I filleted them, but after thinking about it for a bit, decided that it was good quality fish and it'd be pretty tasty canned, so I canned the salmon. I can my own fish because I like to know where my fish is coming from, and the ingredients, and because i can pack it to my own specifications, I know it'll taste better than what I can typically buy. For canned fish I've settled on a half-pint wide-mouth jar as my preferred canning size. It's pretty close to what I typically consume in a day or two. I've done larger jars in the past, but I always ended up refrigerating the jar after I opened it for a week. Smaller jars work better for how I eat the fish. You don't really have to fillet salmon to can it. Commercial canneries just hack the salmon into hunks, stuff it into a can, and the heat and cooking of the canning process softens the bones and makes them part of the salmon. I actually wanted to eat some of this salmon now, so I BBQ'd the backbones I removed and ate that as a snack. The fillets, with the skin on, are what I canned. You can see a couple of bits of skin in these filled, raw jars. The skin on a salmon is where most of the fat on the fish is found, and is a source of many nutrients, so I like to can it with the skin on. But esthetically, the black isn't pleasing to the eye. So I cut the fillets into strips, roll them into O shapes, and stuff them into the jar so that the skin mostly doesn't show. Here's a batch of half pint jars fresh out of the pressure canner. Here's what the finished product looks like. It looks like a solid hunk of salmon in the bottom, and it is -- a rolled slice of a fillet. Canned properly, this will keep at room temperature for years. I usually eat it within 12 months of canning. As with other foods, the final step for me is to label this jar with the the date of canning and contents, as well as any notes about the recipe I used. 6 months from now, if I find a particularly tasty jar of salmon, I'd like to be reminded what was in it. Only can the best quality ingredients. Fresh, and in season, for best results. Meats and fish are low-acid foods, and must be pressure canned. This basically means you fill your cans, put the tops on them, and then put them in a pressure cooker for a specified period of time. For canned salmon, I pressured cooked them at 10lbs pressure for 100 minutes per the guidelines included in my pressure canner. remove jar lid from boiling water bath and screw top on hand-tight. 1) When I do can, I'm typically dealing with a bulk purchase of some sort. In this case, 60lbs of salmon. So I want to be able to handle a large amount of food at once. 2) The processing time for pressure canned items is measured in hours. So by the time I get done with all the food prep and jar filling, I usually have time to do one batch per day. With this particular pressure canner I have the capacity to can 30 to 50lbs of meat at a time. So for this salmon, I was able to can it all in one shot. Big time saver for me. 3) Properly cared for, this canner will last the rest of my life, and probably my childrens and grandchildrens life. So yes, it looks expensive, but given its likely lifespan, it's not that much. Worth buying quality. These are the first cows I've ever owned; they're my $5 calves. I've written about them before, here, here and here. They seem to be doing well so far; putting on weight; glossy coats and healthy. I bottle fed them from day-old, and the drawback to that is that they're hand-tame and friendly. Which is kinda cute when you've got a 20lb calf, but a little scary when you've got a herd of 600lb steers running at you to say hello. I really should have polled their horns when they were small. They really don't know they have horns and when they swing their heads around to lick at a pesky fly bite you'd best be alert or you'll get clocked. The biggest problem I've had with them is that they will get out of the pasture at any opportunity. So I've had to padlock my gates so that random folks visiting the dogpark don't open them to get closer to the cows, and I've had to chase them a couple of times when they've discovered a weak area in the fenceline. The electric fence works pretty well to keep them contained, and I use it to rotate their grazing. As you can see from the pictures, they really haven't made much of a dent in my grass. It's still 2' tall over most of my pasture. I'll probably butcher one of these this November; as near as I can recall I purchased these in March of 2008, so they'll be 20 months old in November. I'll keep the other two steers until next year and probably butcher one at 32 months, mostly to see for myself what the difference is in size, meat consistency and yield. The folks I've talked to about holsteins say that holding them 2 or 3 years gets you the best yield in meat because they don't fill out their huge frames until the 3rd year. I'm going to see if I can get another 4 or 5 of them to add to my herd this coming spring. The prices for these calves is still depressed -- dairies are being offered less than the cost of production for milk and quite a few herds are being slaughtered right now. Consequently, even the market for proven milk cows is down. I've found that the steers respect the electric fence if I put the strand at chest height for them -- which at this point is 3.5' above the ground. Be interesting to see how big these steers get next year. Anyone know what kind of squash this is? It grew (along with about 20 others) where I'd fed some pigs some wilted produce earlier in the year. It's pretty big, weighs about 15lbs. You see a lot of talk in the media about getting closer to your food, and knowing where it comes from, and Christian, his twin brother Jake and their friend Timb did just that this last weekend. If you'd like to have a whole pig for BBQ, I'm happy to supply. Special thanks to Heath Putnam of woolypigs.com for the referral! They purchased a BBQ pig from me, live and on the hoof, and prepped it for their BBQ themselves. Gutting, scraping, mounting it on a rotisserie -- they did the whole thing. They sent me a note about their experience, you'll find it below the pictures. They rented this electric rotisserie from millers rent-all in Edmonds for $25 a day -- having it automatically turn is a great thing! Thanks so much for the pig! It made for an awesome party. Short story: We stopped just as we pulled onto the forest service road to reskewer the pig so it would fit better on the spit before we got to camp for some people that might get squeamish. We stuffed it with garlic and rosemary, sewed him back up, bound his legs with wire and the whole body with string. We carried him victoriously into camp to cheers of excitement, did some touch up details on the body and started up the spit. We got him on at around 2pm and he cooked for 7 hours until the hams got done right around dark. Everyone was crowding around as we took it over for carving. The skin was golden brown all over and moist throughout. Everyone raved about how good it tasted. We had about 25-30 people at the party--all dressed up in goofy viking hats and clothes and drinking beer at this great spot about an hour from the farm near the Mt. Pilchuck trailhead. We had about 15 pounds of leftovers which we divided up between the birthday boys and about 10 pounds that others took. Just thought I would send a note. It was a great event and we really appreciated your help through the process! You're welcome, Christian. Glad you and your friends enjoyed it! I've been a fan of fat for a while, and I do that for the taste, but it turns out that animal fat, far from being the demon we've been led to believe, is actually not as bad as the most-common forms of vegetable fat. Here's a couple of articles comparing animal fat and vegetable fat. That said, as with any food, moderation is the key. When I slaughter a pig and have it cut-and-wrapped by someone, I ask them to save all the fat trim. They'll discard it by default, so I make sure I'm clear that I want them to save it. It usually comes in 25lb bags, frozen. I'll cut the fat into chunks about a pound each, for easier handling mostly. You can just throw the slabs in if you want. It doesn't make any difference in the final product. After filling the pot with chunks of fat, I put in two cups of water, and put the pot on the stove at high heat until the water boils. I'll reduce the heat then to a bare simmer and let the lard render very slowly. It'll bubble and ping while it's rendering -- that's the water being evaporated out of the fat. Slow rendering is the key to producing paper-white lard, which is your goal. For this particular batch I started with 60lbs of raw fat from two pigs. After the fat has rendered for a while, I ladle off the lard. I use small, square loaf pans lined with aluminum foil, and strain the lard through a paper towel as I ladle it out of the pot. Here you can see the lard in the loaf pan. It's a light yellow color at this point, but it'll turn white as its refrigerated. If you overcook your lard, it'll be brown when cooled. Remember, slow render. For this batch it bubbled on the stove for 3 days. I'd periodically add more chunks and ladle out the finished lard. While you're doing this it's often worthwhile to remember how delicious foods are that are fried in lard, how tender pie crusts are, how great refried beans are with a bit of lard and so on and so on. The small square loaf pans result in 2lb blocks of lard, which are a handy size for home cooking uses. You can pull out a block, cut off a hunk, and put the block back into the freezer. It keeps for a year or so. I take the aluminum foil packages, dip them in hot water to free the lard, and then put them into 1 gallon ziplocks which are the closest size to the block. You take as much air out of the bag as you can as you seal it. I should probably figure out how folks package butter because this is basically the same product, and the waxed-paper might work well too. I always end up with a big ball of lard-covered aluminum foil after this. I always label stuff with the date of production/slaughter/cut and what it is. You can see that the overall color of the lard is pretty close to paper white. The 48lbs of lard produced from the original 60lbs of fat will last me this coming year.